“Yes, You did it”! You graduated and finished your vocational training! You are about to get an internship to make use of your skills! Yes, You did it, you are skilled now and can have a job! This is the slogan of the graduation ceremony held specifically for the first batch of graduates who completed the vocational training and internship program Egypt Information and Communication Trust Fund (ICT-TF) has been working on. This program uses information and communication technologies (ICTs) in developing young people and raising their soft and technological skills in order to be qualified to join the labor market. It is also part of the Youth Employment Generation program that is done under the auspices of the Japanese government and in partnership with Education For Employment association (EFE-Egypt). 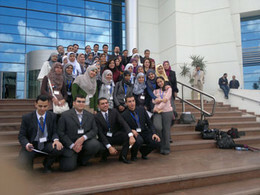 The celebration was held on the 29th of January, 2013 and was hosted at the Egyptian Ministry of Communications and Information Technology (MCIT) premises in the smart village. During the celebration, the program committee distributed graduation certificates to the program trainees. Plus, graduates were asked to present their graduation projects with the aim of availing opportunities to provide more vocational training for these youngsters in a way that meets the needs of the labor market and to help them find more suitable jobs.